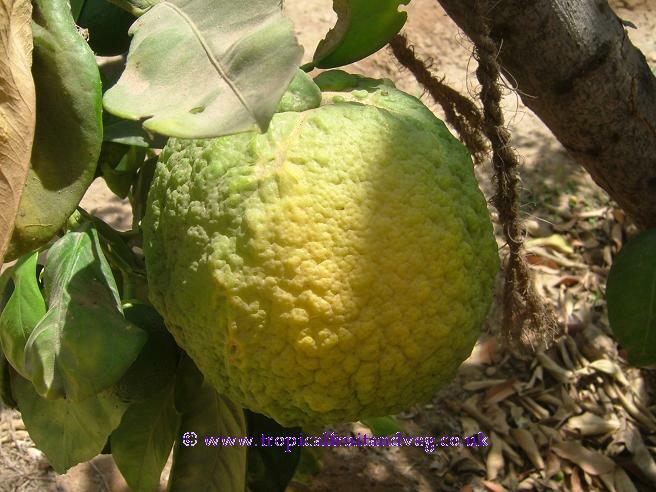 Doringu is a large citrus fruit hybrid, similar to the ugli fruit from the Americas, and is rumoured to be a cross between pommelo and lime. The doringu tree is similar to the pommelo but much smaller, maximum 3 m tall. 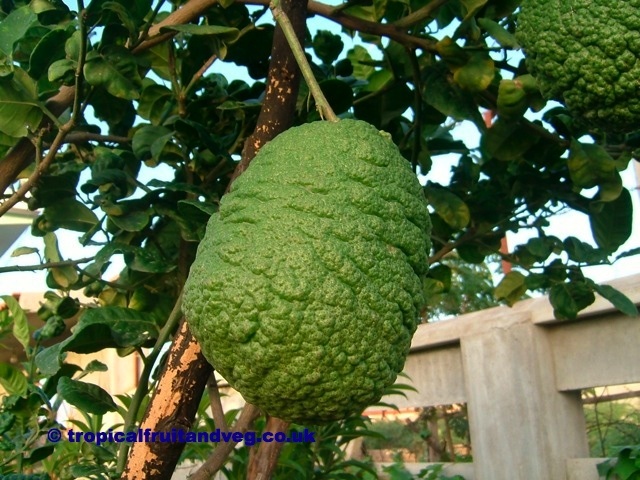 The fruit is similar in size to the pommelo but irregular in shape (same tree will produce both roundish and oval fruits). Like the pommelo, the skin is very thick and green but much rougher and very tough. Unlike other citrus fruits, the central 'pulp' of doringu is very dry and tasteless and usually discarded. The thick skin tastes very bitter and sour. In India it is cut into slices and used mainly in pickles, the bitterness is thought to help stomach and digestive problems. Pickled doringu is used to treat stomach upsets. Doringu will only grow in warm dry climates with plenty of sun. It can withstand temperatures of 40� C.
Doringu will grow in poor soil and will survive periods of drought. It will require plenty of water for large fruits to develop which can take 4 to 6 months. From seeds and cuttings. It is usually grafted onto lime rootstock for quicker fruit production.